Transport yourself back to the 1700s and discover Edinburgh's hidden streets, then wander up the Royal Mile for whisky tastings and optical illusions. Everyone in Edinburgh knows that you need to be prepared for all weathers, packing your sunglasses AND your umbrella at all times! But if you're staying in Edinburgh when the rain comes on, where can you go? We've selected some of the best things to do in Edinburgh on a rainy day. Our top three suggestions are all located on The Royal Mile, so you won't have to walk too far between them in the rain. These mysterious streets lie deep underground, beneath the Royal Mile. Preserved and untouched since 1700s, visitors can discover these hidden streets and buildings with a costumed character guide, who will share the experience of living 400 years ago. The Real Mary King's Close is a truly incredible experience so unique to Edinburgh, and highly recommended by us. The Scotch Whisky Experience offers a fun tour for visitors to discover the whisky making process (through virtual reality on a barrel ride!) followed by a whisky tasting. The world's largest private collection of whisky is housed here, and the staff are all knowledgeable and friendly. There are different levels of tours, with something for everyone, from beginners to connoisseurs. The Camera Obscura is Edinburgh's oldest visitor attraction. See Edinburgh through the Victorian pinhole camera at the top of the tower and then explore several newer floors of illusions, tricks, puzzles and wonders. It's right next to Edinburgh Castle, so it's great to combine with a visit there too. Other things to do in Edinburgh on a rainy day include Edinburgh's brilliant museums and galleries. The National Museum of Scotland, Scottish National Gallery, the Writers' Museum and Surgeons Hall Museums, to name just a few. Not forgetting, our fantastic theatres and cinemas. Why not catch a show at Edinburgh Playhouse or the Festival Theatre? Or, just stay cosy in your holiday apartment until the rain stops! 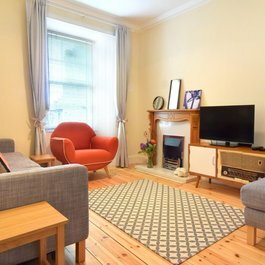 If you're looking for self-catering accommodation in Edinburgh, check out our wide selection of holiday properties at Lets Get Local. And if you need any further suggestions of things to do, please get in touch today. First Visit to the Edinburgh Festival? Here come the festivals! International, Fringe, Jazz and Blues, Art, Book and Tattoo. Welcome to the whirlwind of culture that is Edinburgh in summer. Our itinerary for a great family day out in Edinburgh with young children. As we say farewell to Christmas and Hogmanay for another year, we don't have to wait too long for the next big celebration in Scotland. Burns Night!